Oven baked beef ribs aren't just what you make because you can't use your grill or smoker. Yes, its been raining for a few days here in "sunny" southern California and I cooked these ribs in the oven. But that's just a coincidence. This recipe really stands on its own. In my opinion, the flavor of USDA Choice beef ribs is hard to beat. In fact, I usually eat 'em nekkid (without BBQ sauce). However, I do this when they've been spice rubbed and smoked over Texas post oak or hickory wood for hours. Since this recipe is for ribs that have been slow-cooked in the oven, I've come up with a marinade that complements the meat while still allowing its rich beefy flavor to shine through. Also of note is that I make my own Italian salad dressing. So when I saw a recipe for marinating beef in a generic bottle of Balsamic vinaigrette dressing, I figured I'd try a homemade Balsamic vinegar-based marinade. This, my friend, was an experiment gone good - real good. Add vinegar and salt to a small pot or sauce pan and heat to dissolve salt. Once salt is dissolved, let mixture cool and then stir in remaining ingredients. Set marinade aside. (Note: My experience is that without the above step, the undissolved salt is not distributed equally throughout the marinade when you pour it over the ribs. The end result is that some portions of the meat are more or less salty than others). Remove the tough membrane and excess fat on the underside of your ribs. Rinse ribs and pat dry. Put ribs in a non-reactive container or large freezer bag. Pour marinade over the ribs and massage it into the meat. Refrigerate ribs, meat side down, for 8 hours or overnight. Turn ribs occassionally. 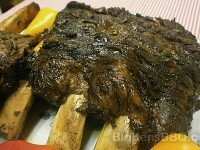 When you're ready to cook your ribs, remove them from the refrigerator 30-45 minutes before placing them in the oven. Place ribs, bone-side down, in a covered roasting pan. Cook for about 3 to 3.5 hours. Once ribs are done, remove from oven and let rest for 5 minutes before serving.